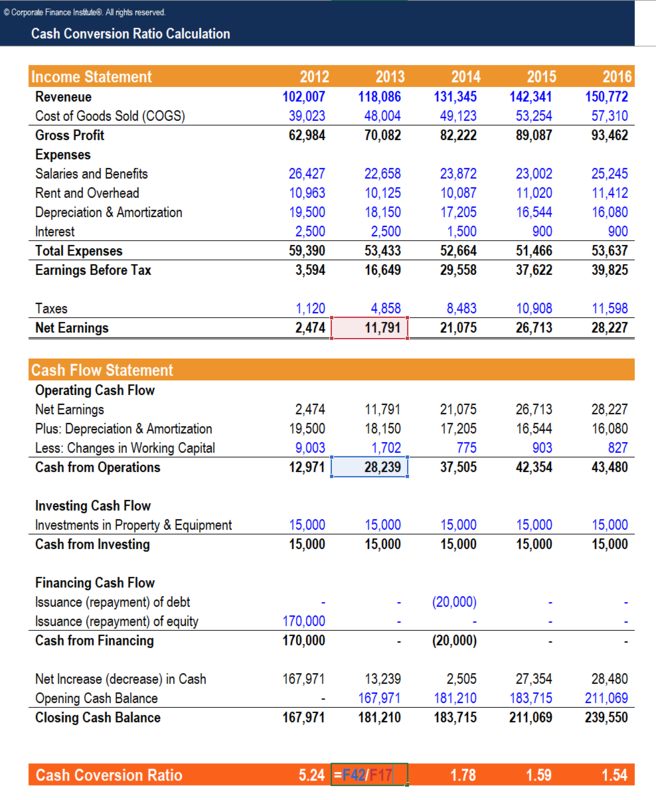 This Cash Conversion Ratio Template will demonstrate how to calculate the cash conversion rate using the income statement and cash flow statement. The Cash Conversion Ratio (CCR), also known as cash conversion rate, is a financial management tool used to determine the ratio of the cash flowsStatement of Cash FlowsThe Statement of Cash Flows is one of the 3 key financial statements that reports the cash generated and spent during a specific time period, it acts as a bridge between the income statement and balance sheet of a company to its net profit. In other words, it is a comparison of how much cash flow a company generates compared to its accounting profit. CCR is a quick way to determine the disparity between a company’s cash flow and net profit. A high cash conversion ratio indicates that the company has excess cash flow compared to its net profit. For mature companies, it is common to see a high CCR because they tend to earn considerably high profits and have accumulated large amount of cash. In contrast, companies in the start-up or growth stage tend to have low or even negative cash flows due to the required amount of capital invested in the business. In early stages, companies often find themselves earning negative profits until they reach a break-even point, thus the CRR of these companies would also be negative or low.